You may notice your toilet draining sluggishly or water in the basin overflowing to the rim. 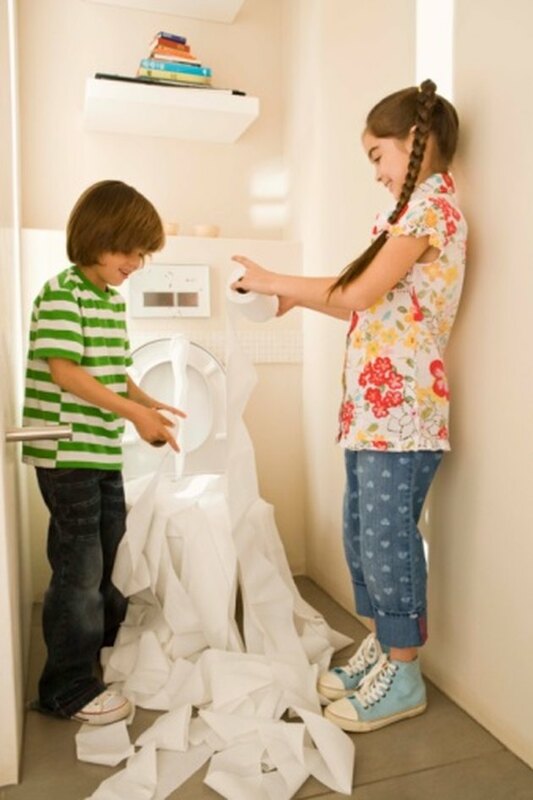 Toilets may become clogged from too much paper stuffed into the trap or from an errant toy, washcloth or cellphone deposited into the sewer system. Rather than calling the plumber and incurring an expensive bill, you can check the toilet and waste pipes yourself. Get a helper to assist you with the project. Some children are enthralled with stuffing the toilet with paper or toys. Turn off the water supply to the toilet. Look for the shut-off valve behind the toilet and turn the valve completely clockwise to close. Use the small plastic container to scoop out water from the toilet tank and toilet basin. Put on gloves and reach into the trap inside the bowl. The object may be lodged in the mouth of the trap and you might be able to pull it out with your hand. If not, continue to the next step. Insert the end of the closet auger into the toilet trap inside the bowl. Push the auger in firmly. Rotate the handle of the auger clockwise slowly. As the mechanism spins, the metal wire rotates and the hook on the end will grasp the object stuck inside the trap. If rotating the handle becomes difficult to turn, rotate the handle in the opposite direction a little, then rotate the handle clockwise again. When you feel the auger head reach the object, slowly rotate the handle counterclockwise to draw the object out of the trap. If the object remains stuck, continue to the next step. Remove the toilet. Start by using the plastic putty knife to remove the plastic bolt covers that secure the toilet to the floor. Use the adjustable wrench to remove the bolts. With a helper, lift up the toilet from the floor. Lean the toilet to the side and inspect the trap for the object. If the object remains stuck, continue to the next step. Set the toilet aside and inspect the waste pipe in the floor. Insert a plumber's auger into the pipe and gently rotate the auger. If the object remains stuck, continue to the next step. Stuff a rag into the waste pipe to prevent sewer gases from rising up into the bathroom. Locate the sewer cleanout plug; this is usually in a basement or crawlspace. Place a bucket below the plug to catch any waste water. Slowly loosen the plug by turning the pipe wrench counterclockwise. Loosen the plug just enough to allow fluid to run into the bucket. When the bucket is full, empty it outside. Repeat this procedure until no more fluid seeps from the cleanout into the bucket. Remove the cleanout plug and insert the plumber's auger into the pipe. Feed the auger wire as far as it will go into the pipe until you feel resistance. Twist the auger clockwise while working the snake back and forth in the pipe. Withdraw the auger and check for the object.